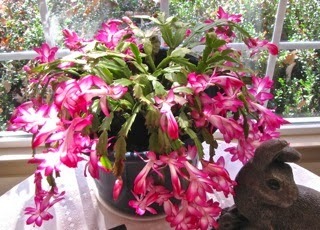 Home Life - When our dear friends, Ken and Yvonne Bushell, moved from the neighborhood, they asked if we wanted a Christmas cactus. I'm not much on house plants. Not that I don't enjoy seeing them and fussing over them, it's just that we have always had cats and didn't want them chewing on anything that would be toxic to them. It is one that is not toxic to dogs or cats. Ken told us this Christmas cactus was in the garage and that sounded like such a lonely place for it, so I wanted to give it a "life" of window time and sunshine. In the good weather months it remains outdoors, in the winter it resides in the breakfast area which becomes my office since I usually spend Spring, Summer and Autumn on the screened porch. It doesn't bloom at Christmas, but always blooms in early November. It sure is a beauty and every year I send Ken and Yvonne photos of it. I have my office area similar to last year when I decided to bring the chaise indoors. Since the breakfast area window is southwest facing, it's a nice cozy and toasty place to spend the sunny days. 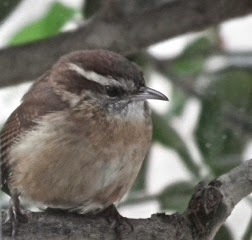 Even on dreary cloudy days I've got the birds and squirrels all over the bushes at the window and on the feeders and birdbath, so it's a wonderful spot! Gardening - In the last issue of this newsletter I mentioned that Nandina berries were toxic to wildlife. We were informed otherwise before we put a few bushes in to hide the view of the storage shed, so when the berries are ripe we cut them off. They make bright and beautiful displays in the house especially for the holidays beginning with Thanksgiving. 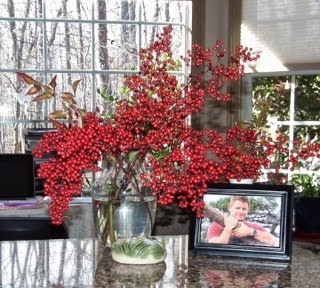 I keep a photo of our son on the kitchen counter and always like to place some flowers by him. I think the berries are a nice option also. They sure do show off in color. If you didn't see the post on "Nandina Berries Kill Birds" view it now. Spiritual - Randal and I watch or listen to a spiritual message at lunch and dinner. It fills our minds with good things and keeps our joy intact while it seems others are focused on the world falling to pieces. Psalm 91 tells us of God's protection over us and He's given us all things that pertain to life and godliness (I Peter 1:3). Jesus said in a prayer to the Father: "I do not ask that you take them out of the world, but that you keep them from the evil one. They are not of the world, just as I am not of the world. Sanctify them in the truth; your word is truth" (John 17:15-17). The more we put truth into our minds, the more spiritually-minded we can be. Whatever we focus on the most will be what is magnified in our lives the most. If you've read anything on quantum physics, you already know that thoughts produce the reality of what is around us, so it's important to keep our thoughts on good things. Watching CNN (constantly negative news) is not an asset to our lives and watching soap operas certainly do not bring anything spiritual to our lives. We have to overcome all this negative stuff, or we end up swimming in it, and from what I see many people are literally swimming in it. There even seems to be a frenzy to talk about it and repeat it as if sharing it will unload some of the burden of fear. When we are in fear of any sort, we are in unbelief and that's the opposite of faith. "For they that are after the flesh (things going on in the physical realm) do mind the things of the flesh; but they that are after the Spirit the things of the Spirit" (Romans 8:5 KJV). Another translation says, "Those who are dominated by the sinful nature think about sinful things, but those who are controlled by the Holy Spirit think about things that please the Spirit" (Romans 8:5 NLT). Recently we watched a video that was very inspiring for those of us who try to "DO" our way into God's blessings. God's already done everything and Jesus said all we need to do is believe in our hearts to receive it. Just as when we doubt in our hearts we don't receive it. "For verily I say unto you, That whosoever shall say unto this mountain, Be removed, and be cast into the sea; and shall not doubt in his heart, but shall believe that those things which he said shall come to pass; he shall have whatsoever he said" (Mark 11:23). Here's a great message on video at YouTube - Programmed For Heaven. Here's an intro from the teacher, Clint Byars: "Believers have been given a new heart and new spirit. Our new heart is no longer wicked and our spirit is perfect. This new heart is encoded with God's truth and it hears God clearly. We don't have to try to figure out how to hear God or believe the truth, we're already recreated into a king of being that naturally believes, hears and follows God. Our goal is not to try to hear God, our goal is to stop clouding His voice by trying to hear Him. The only time we're not following God is when we're worrying, afraid, asking for something we already have or trying to accomplish spiritual realities in our flesh. God would not put a new heart in you that then needs to figure out how to believe. The new heart believes, we just need to tend the garden of our heart with the tools of peace so this magnificent transformation God has begun in us is completed the way it started, by His spirit." Travel Virginia - We live off the same highway that Monticello is on so we visit the property quite often since parts of it have open access and the beauty of the place is incredible. Monticello was the primary plantation of Thomas Jefferson, the third President of the United States, who, after inheriting quite a large amount of land from his father, started building Monticello when he was 26 years old in the Charlottesville, Virginia area. At one time it encompassed 5,000 acres but is now maintained at 2,500 acres. 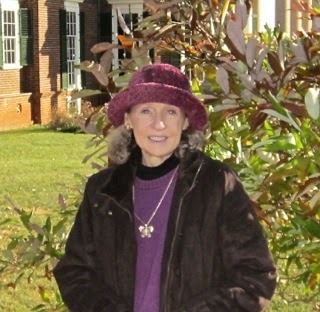 Years back they built a new visitor's center which now allows you access to many free areas of the estate which includes the two-story museum, a nature trail, a cafe, a gift shop and a nursery where you can buy historic plants that TJ used at Monticello. They are still being grown at nearby Tufton Farm. We did some letterboxing one day and enjoyed some of the activities around the visitor's center and took some pretty Autumn photos. 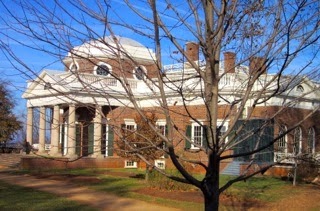 Then on November 30th, they had their 2nd annual Open House at Monticello which was very cool. We got to take the shuttle up to the mountaintop where Mr. Jefferson built the house and gardens and an amazing plantation of horticulture and agricultural displays and research. The architecture is also something I enjoy seeing. Travel Georgia - In the last issue of this newsletter, I mentioned my trip to Newnan, GA, and gave you a couple of links to photos. In this issue I have the rest of the photos ready to view. The downtown area is very historical and inviting with a lot of shops and places to dine. There's also a lot of community events downtown with free movies and musical nights and various celebrations and holiday events. The downtown area also includes historic Oak Hill Cemetery which was very interesting with a walking tour brochure giving you information behind the names on the monuments. View Oak Hill Cemetery Photos. 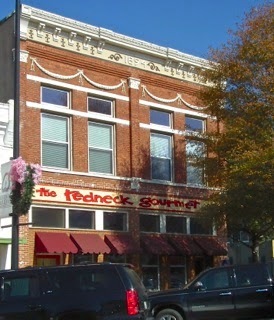 I was intrigued with The Redneck Gourmet restaurant and read that the name came from the two owners, one a redneck and the other gourmet. They have an interesting menu. The building was erected in 1894 initially occupied by the Newnan Banking Co. and a drug store. Apparently the restaurant is no stranger to celebrities. It has drawn the likes of country music star Alan Jackson, comedian Jeff Foxworthy, Atlanta Falcons linebacker Keith Brooking and former Atlanta Braves pitcher Steve Bedrosian (info from their website). They have two locations and the other one is in Senoia to the east of Newnan which is a town with a long list of movies and television series filmed there. My favorite place was Cochran Mill Nature Center. I went with my friend, Robin, who lives in the area, and it was super enjoyable. 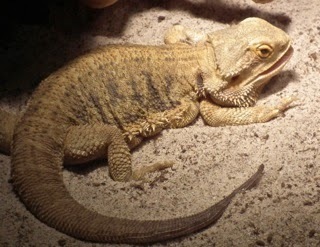 They take in wildlife that is non-releaseable which includes a lot of reptiles that people once wanted as pets and now no longer want to care for them. They can't be released since they've never had to hunt and feed themselves. They also have an area outside of raptors that are either non-releaseable or are being rehabilitated to be released back into the wild. The setting is amazing with 50 acres of land and adjacent to Cochran Mill Park, an 800-acre nature preserve. Such a beautiful and peaceful setting in Palmetto, Georgia. View Cochran Mill Nature Center Photos. 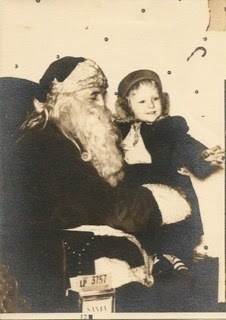 Christmas - I've been looking back at this past year and bringing to mind all the good things God has done for me. We don't do much for Christmas since the focus of the world seems to be giving people who have too much stuff more stuff to deal with. The celebration of the Lord's birth seems to be set aside. He who gave His own life so that we could have eternal life. We enjoy the amazing peace of December that seems so increased as we look at the world rev up and stress up for busyness. It's nice to enjoy the musicals, church drama productions, hot apple cider evenings with homemade cookies, and the movies that portray a simpler side of Christmas. Am I being too judgmental? Probably so .... it makes me sad to look back at the simplicity of Christmas that I had growing up in the 50's in a small town, compared to what it has become now. We stopped the whole gift exchange thing about 13 years ago. Interestingly when we did it, we got a response we did not expect. Friends and all but two members of Randal's family thought it was a grand idea. Those who seem to thrive and run on stress power couldn't quite grasp the concept. They were geared up for the adrenalin rush that comes before Thanksgiving and remains into January when they find themselves sick with the flu wondering why their immune system is so weak. We exchange gifts with our son through the Amazon Wish List keeping it simple. Instead, we like to make birthdays real special in our family. Randal and I sometimes exchange a gift with each other if we can think of something we'd like to have. So far, that's not happened yet this year. Thinking of a couple of items for our son is about all we could muster up this year. Money is not the issue, but keeping life more simple is. I enjoy giving all year long so we are not without gifts to open from neighbors or friends, but I consider them more Thanksgiving gifts than Christmas. Regardless, it's nice to be remembered. We are not Bah Humbug folks ... we just don't want to join the Christmas madness. We've never experienced the frenzy of Black Friday which it seems now has become more than a day's event. Imagine how blessed we might feel if we spent our Christmas dollars on people who have almost nothing. Well, I don't want this to be a negative newsletter ... just pondering out loud and tossing out some possibilities for those who are tired of Christmas American Style. There have been others who have made similar changes and it becomes more of a time of joy, peace and thanksgiving for all that we have already. You might want to mention this "novel idea" at your family gathering to see how others may be thinking. Maybe after opening another one of those gifts that is 100 miles away from anything you would choose [grin]. Maybe there are others who would like a more peaceful Christmas. At the very least maybe you could arrange for a gift exchange of only one person in the family to shop for. That has gone over extremely well with families. And maybe you could begin giving consumable gifts. A great idea, especially for those who are home all day or a loved one that is not very mobile, would be a birdfeeder and black-oil sunflower seeds to fill it (this seed brings in the most variety of birds). Something easier? 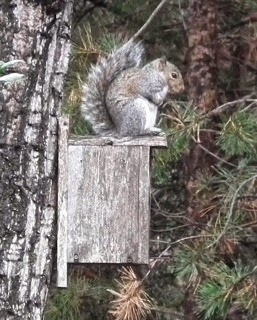 How about a suet feeder with a few refills!? Birds need the extra quick energy that suet gives them and if they're in a wooded area, they'll see woodpeckers too. I think what I'm really trying to say is to make Christmas what YOU want it to be. Don't be pressured by family traditions that you don't want your own nuclear family to pattern life after. You cannot imagine how great it is to have the peace part of this throughout the whole month of December. Listen to your thoughts and words ... how do you really feel about the madness of Christmas? Follow your heart. "Glory to God in the highest, and on earth peace, good will toward men" (Luke 2:14). Here's a link to the online version of this newsletter. Click on it and on the left sidebar there will be an option to share in various ways. The top one is to email it to somebody. Do You Have To Be Right? Animal Hoarding - What To Do If You Suspect This? Are You a Victim of Your Thoughts? © All photos unless otherwise noted are the property of Donna L. Watkins and can be displayed elsewhere with approval. Contact me through the blog website.